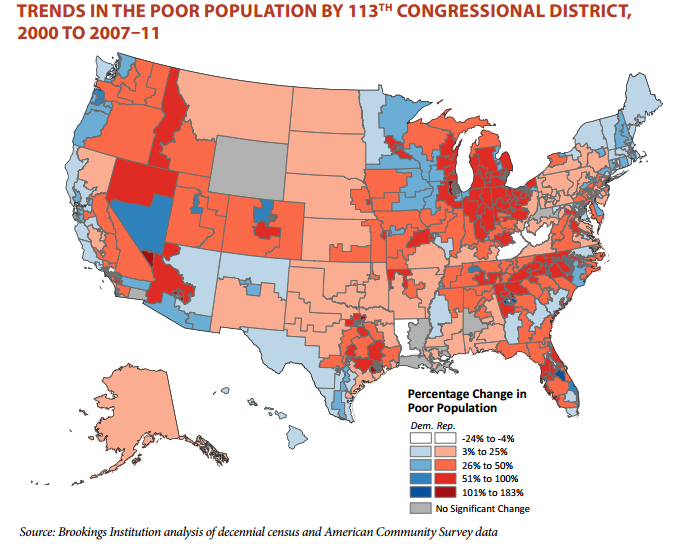 Poverty rose more throughout the 2000s in Republican congressional districts than in Democratic districts, though it’s still more prevalent in Democratic districts, according to a new analysis from the Brookings Institution. The Brookings researchers used data from the 2000 Census and pooled data from the 2007-2011 American Community Surveys to calculate poverty rates at the census-tract level, then mapped them within current district boundaries. The results show that the poverty rate in the average GOP district rose 2.3 percentage points over the decade, from 10.9% to 13.2%, versus an average increase of 1.8 percentage points (from 13.9% to 15.7%) in Democratic districts. By decade’s end, there were nearly as many people living in poverty in Republican-represented districts (21.1 million) as in Democratic-represented ones (21.6 million). In 2000, there were 18.25 million people in poverty in Democratic districts and 15.65 in Republican districts. Among both Republican and Democratic districts, poverty rates rose more in districts that had below-average poverty in 2000 — an indication of how deeply the Great Recession bit even in areas with little previous experience of hard times. For example, in Illinois’ 8th District, which encompasses Chicago’s northwest and western suburbs and is represented by Democrat Tammy Duckworth, the poverty rate rose from 5.3% in 2000 to 9.2% in the 2007-11 period, according to Brookings’s data. Minnesota’s 3rd District, which includes some of the wealthiest suburbs in the Twin Cities area and is represented by Republican Erik Paulsen, saw its poverty rate rise from 3.4% in 2000 to 6.2% in 2007-11. But regardless of party or urban-suburban divide, the industrial Midwest, intermountain West and parts of the South stand out as regions where poverty rose the most last decade.